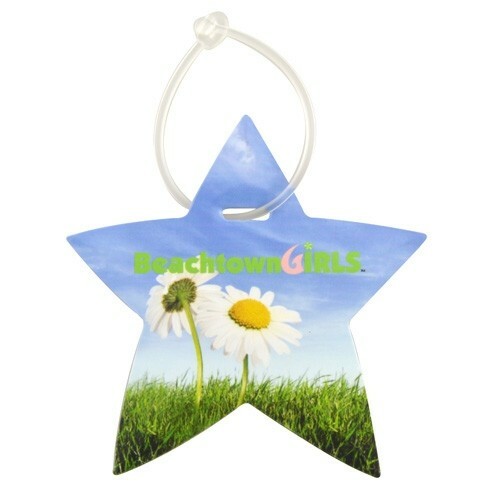 Star luggage tag. Made of Styrene Plastic. Completely recyclable. T-style or buckle strap. Bulk packed. Silkscreen Set-up charge $50(V) per color. Additional color run charge $.30(V) per piece. Re-order setup charge $30(V) per color (Run charges apply). Direct Full Color Set-up charge $45(V). Direct Full Color run charge $.35(V) per piece. Re-order set-up charge $30(V) (Run charges apply).